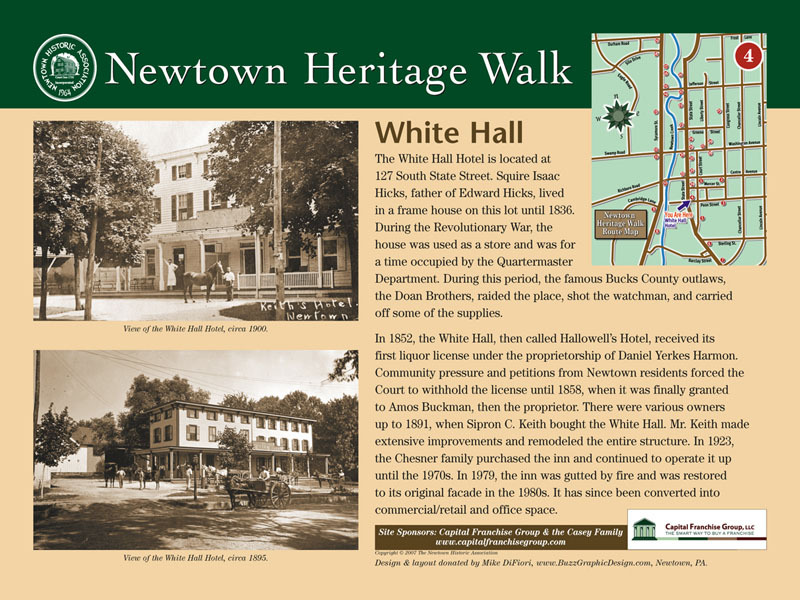 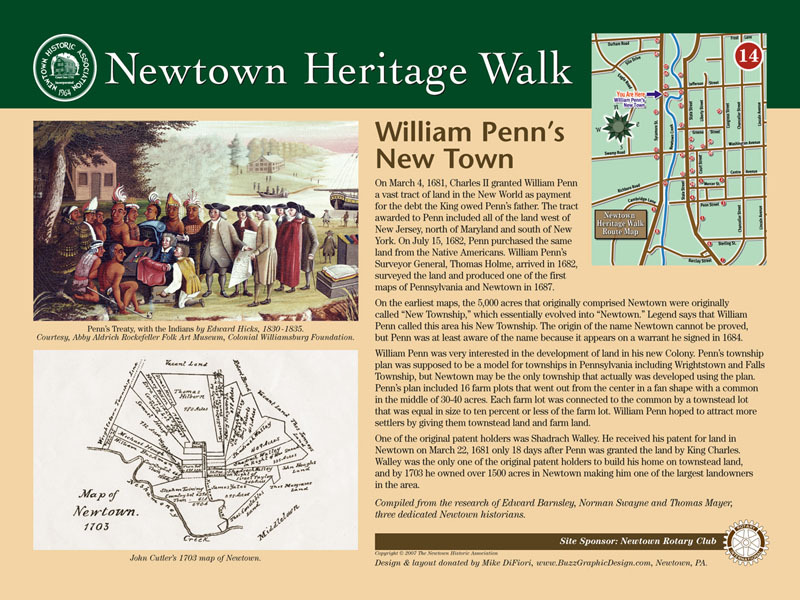 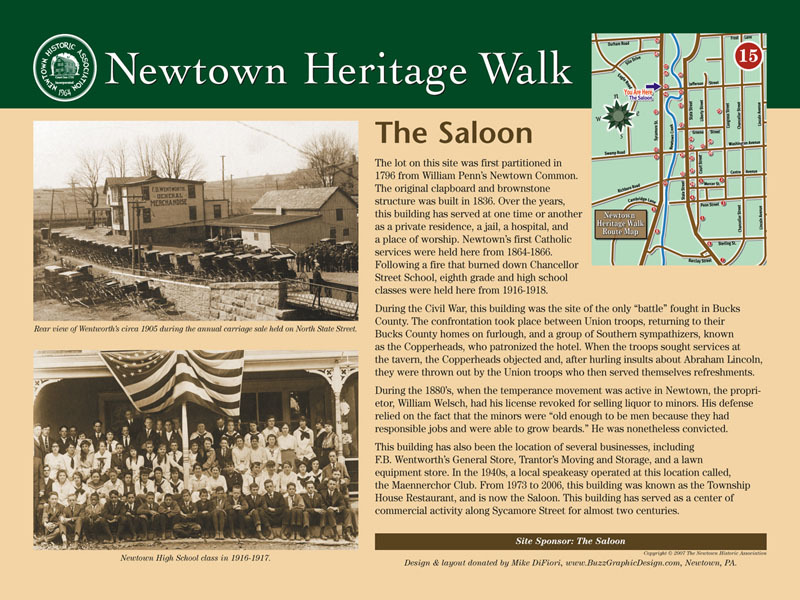 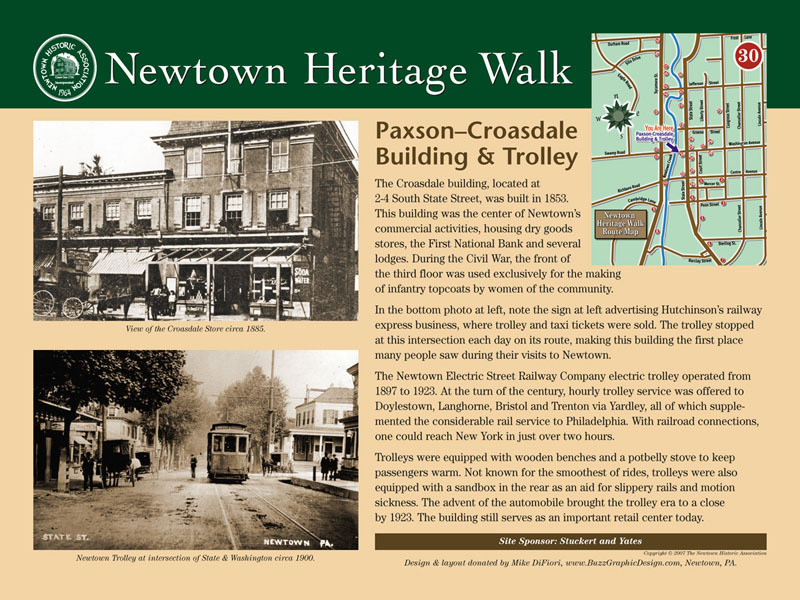 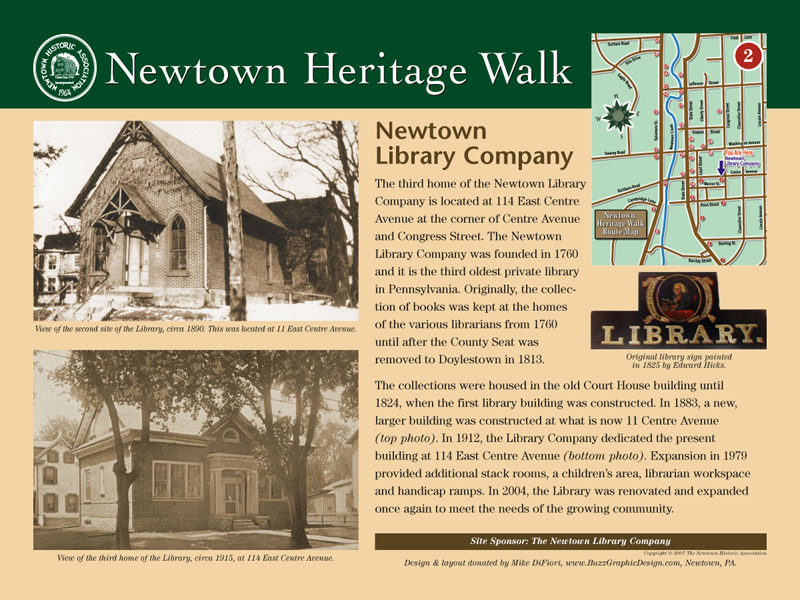 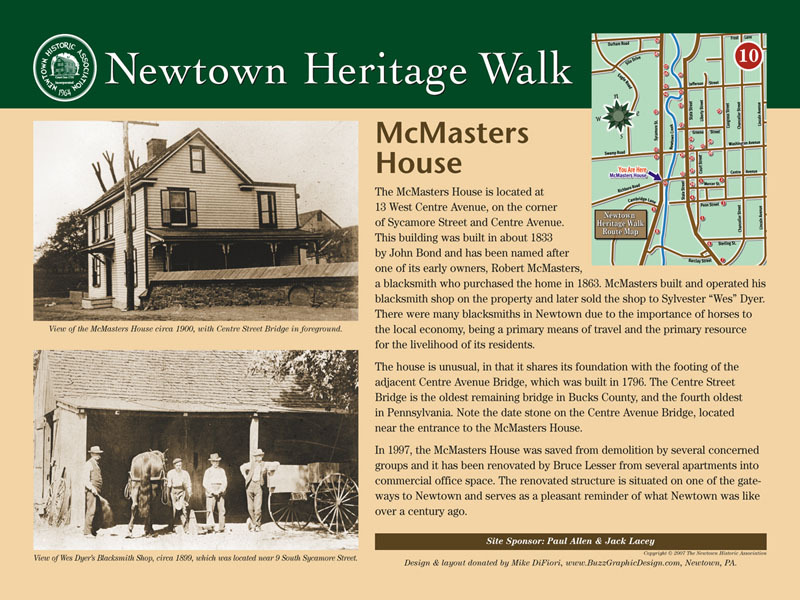 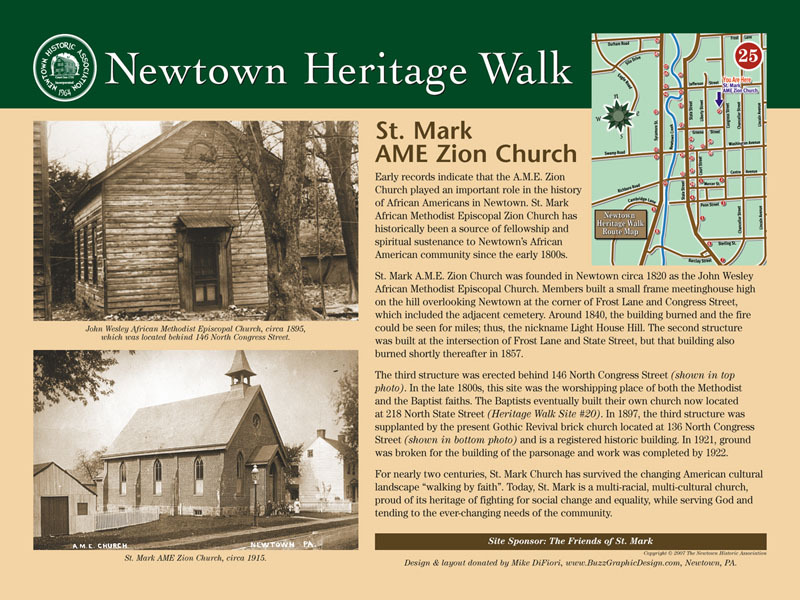 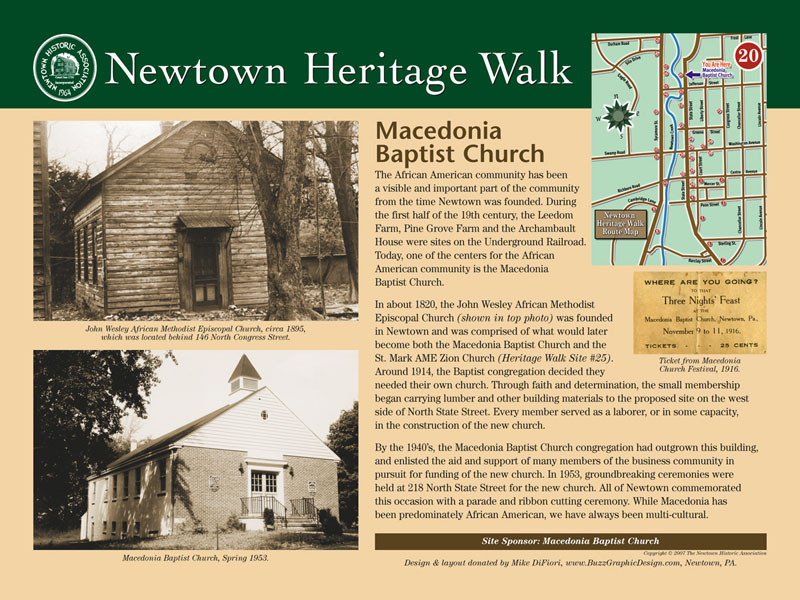 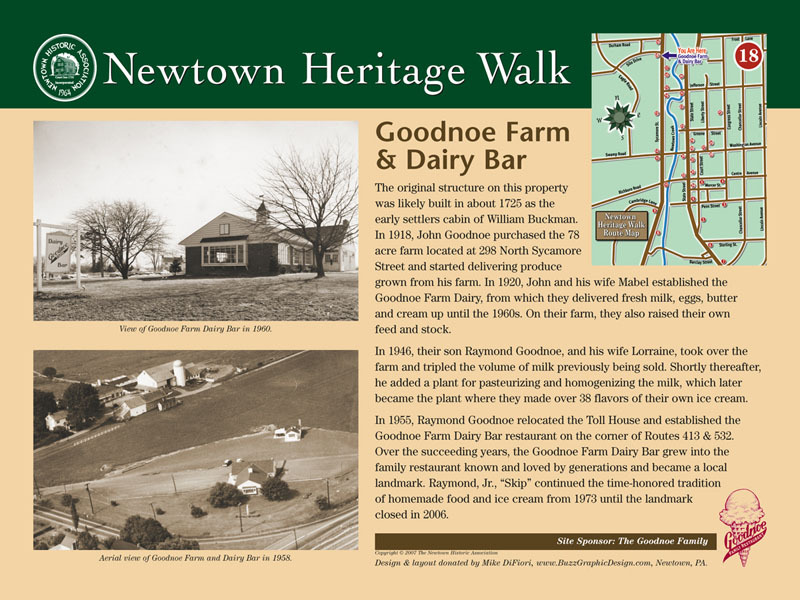 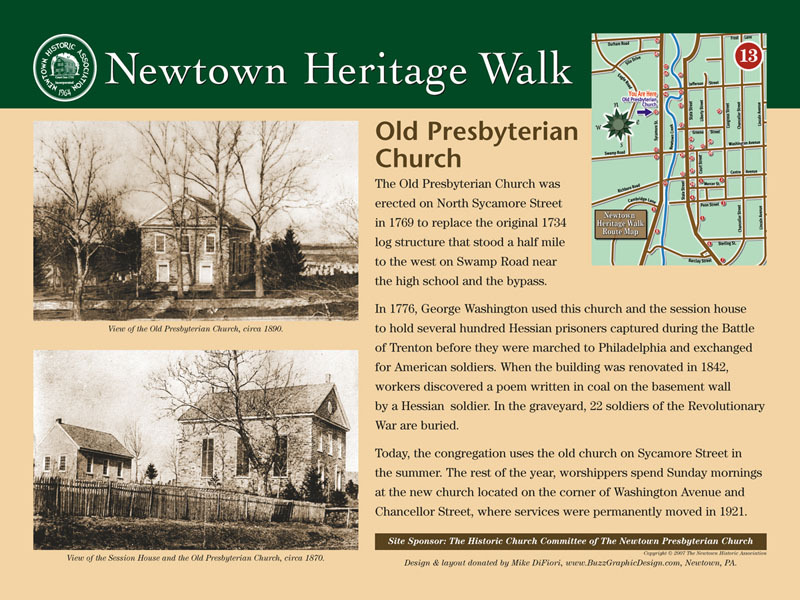 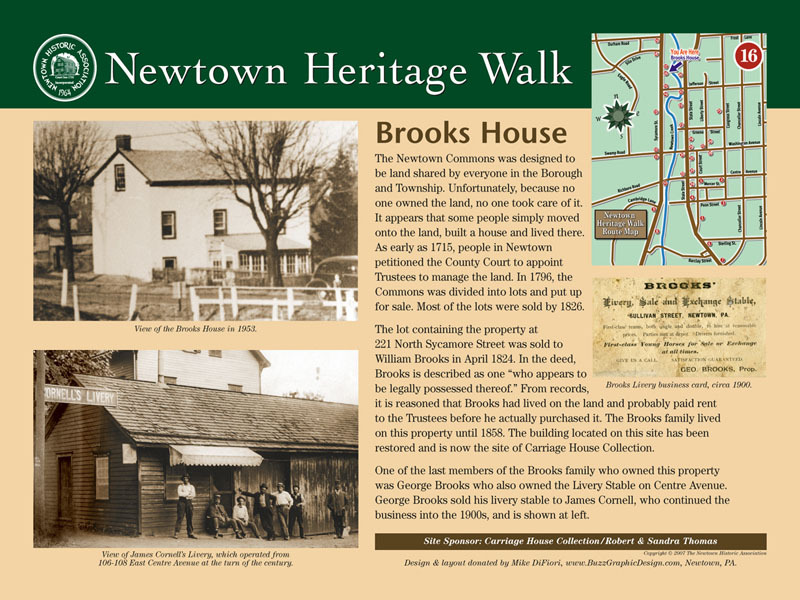 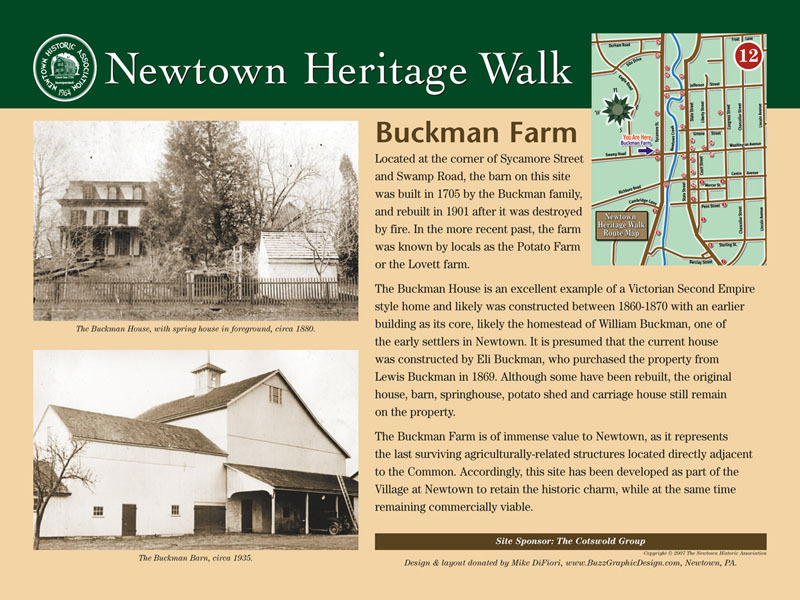 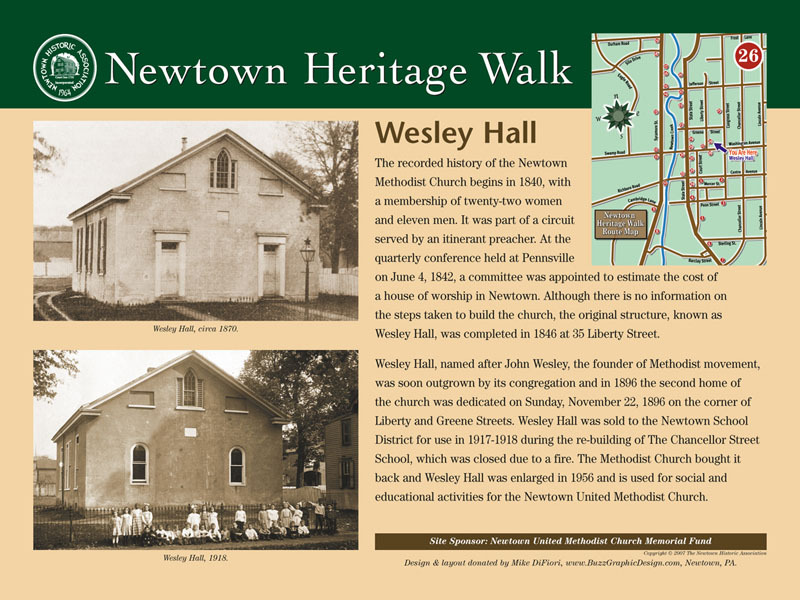 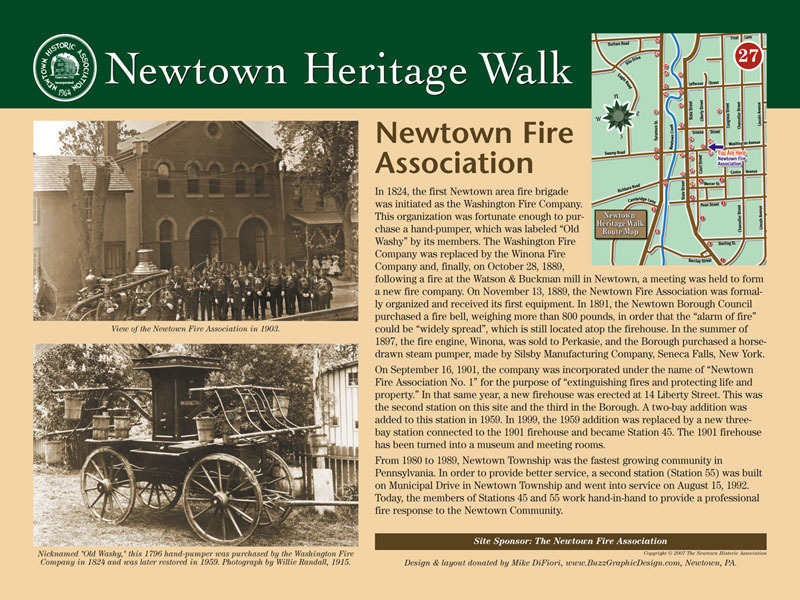 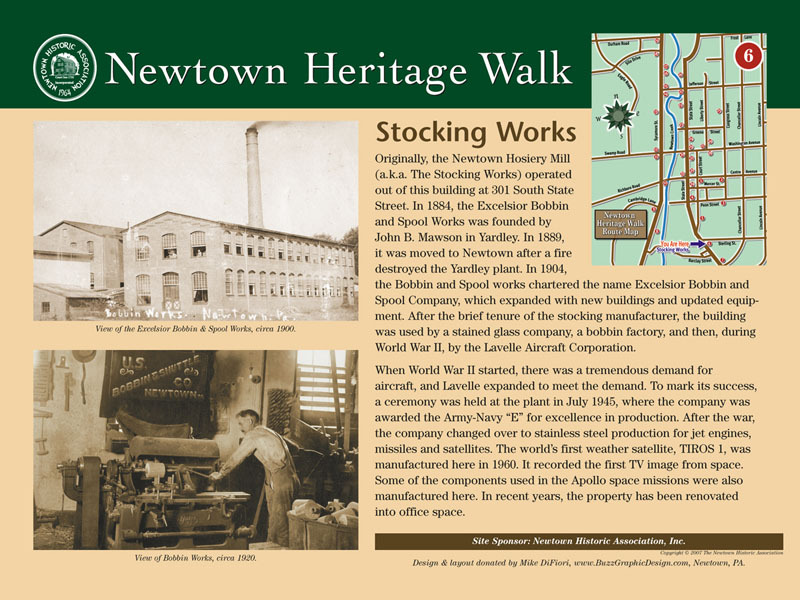 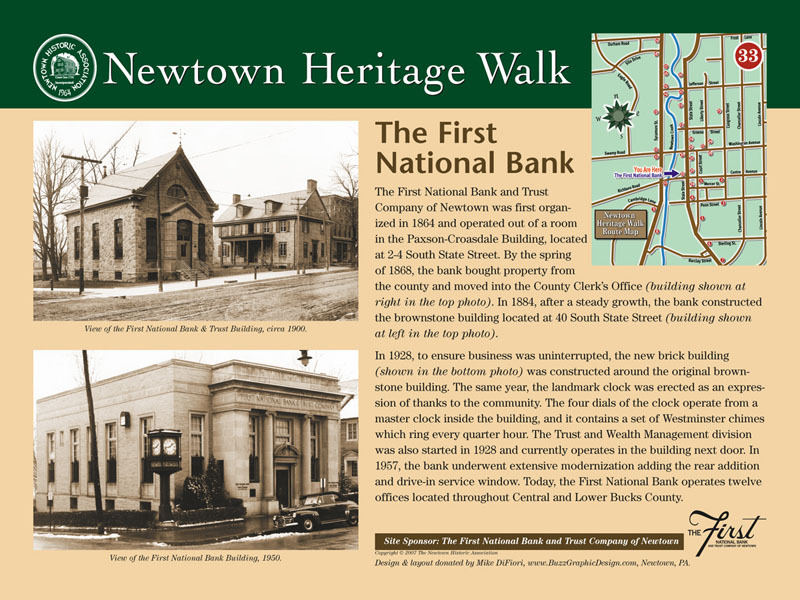 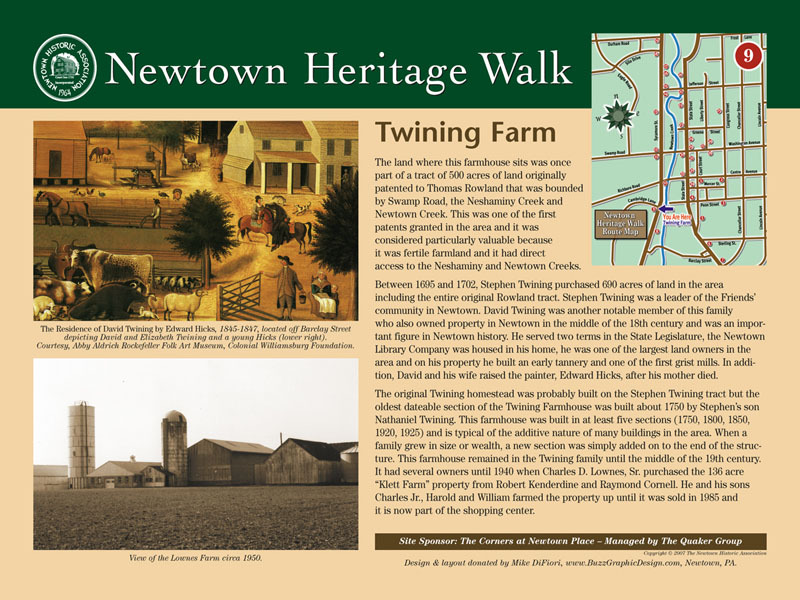 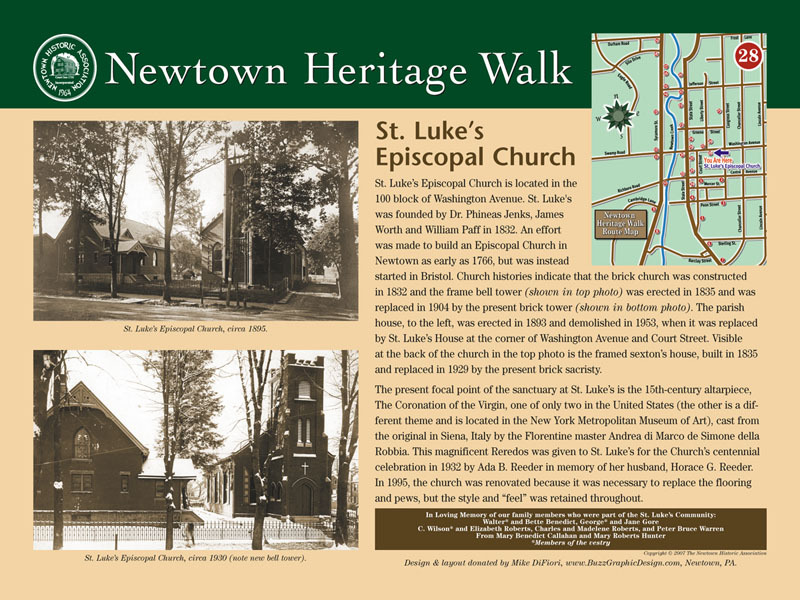 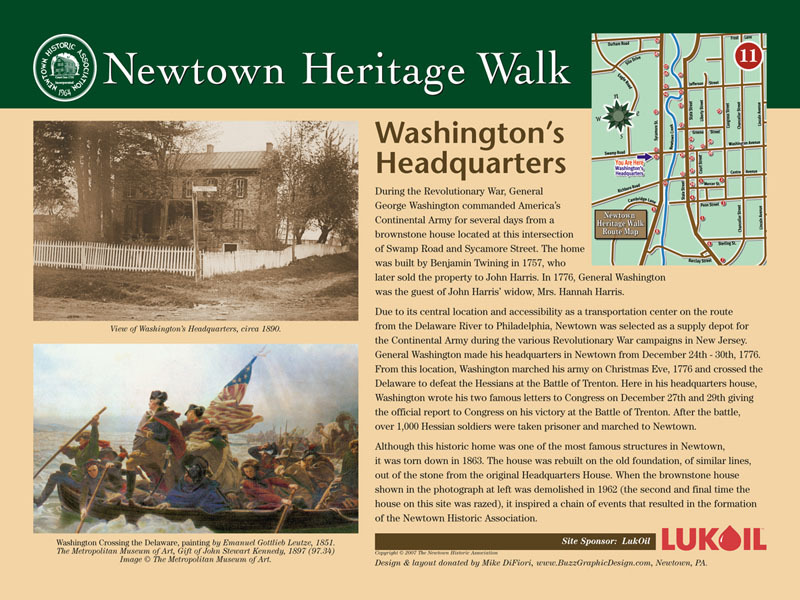 The Newtown Heritage Walk is a self-guided walking tour consisting of thirty-four 18” x 24” wayside markers at historically significant sites along State Street (Newtown Borough) and Sycamore Street (Newtown Township). 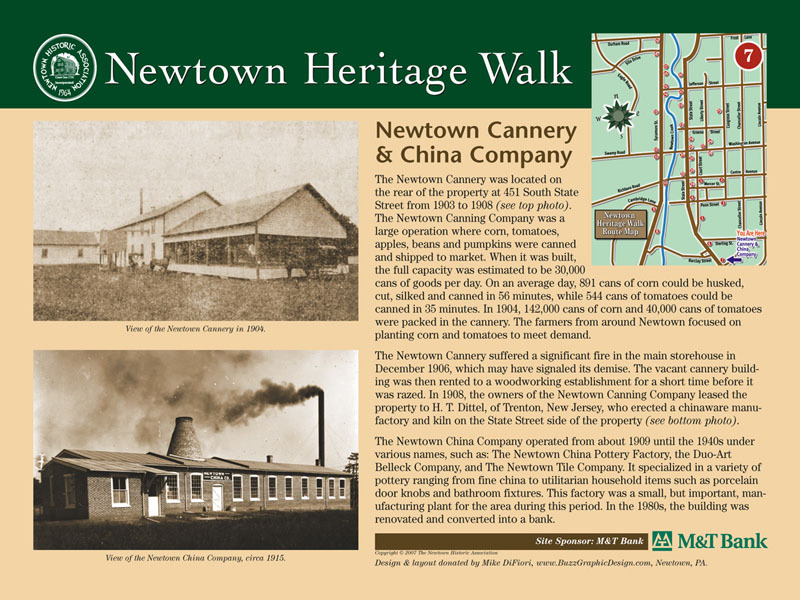 Each stop has been selected because of its historical value to the Newtown community, featuring sites from the 18th, 19th and 20th centuries. 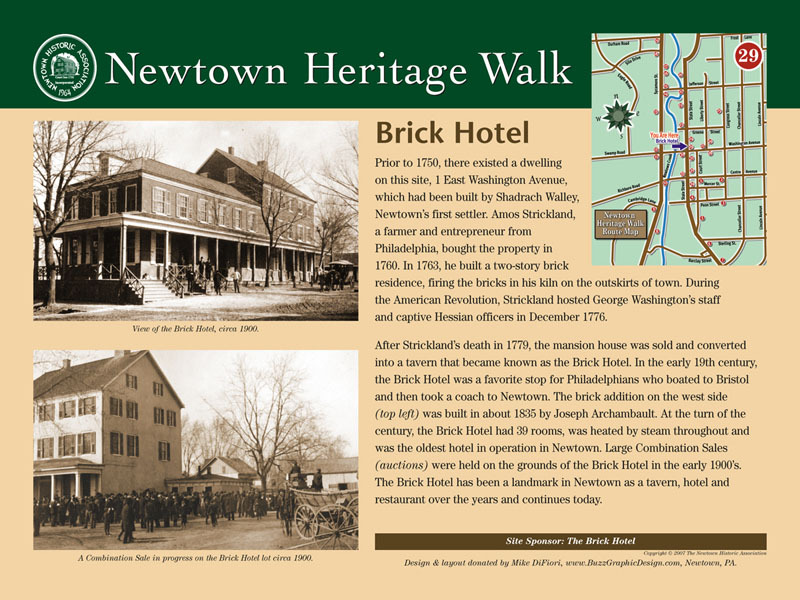 The Heritage Walk is modeled after similar wayside programs in Gettysburg, Harrisburg, Carlisle, the Delaware Canal, and other historic locations in Pennsylvania. 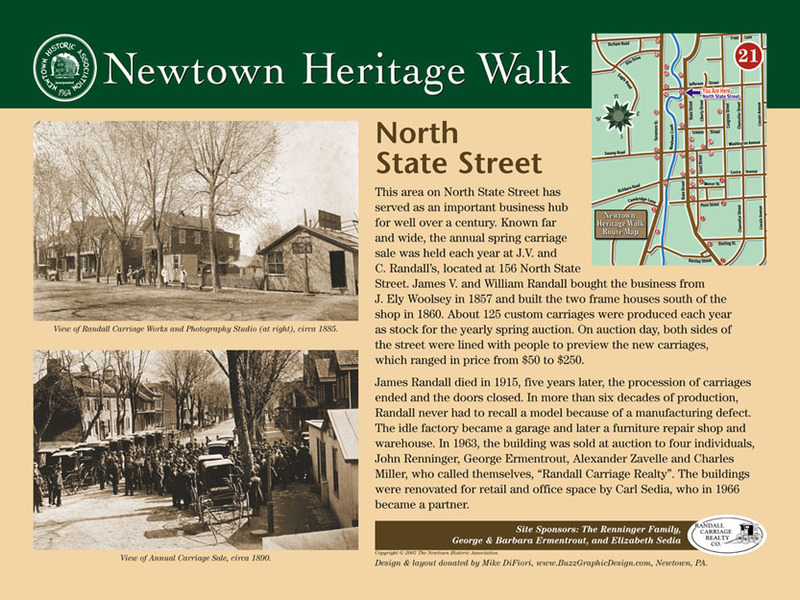 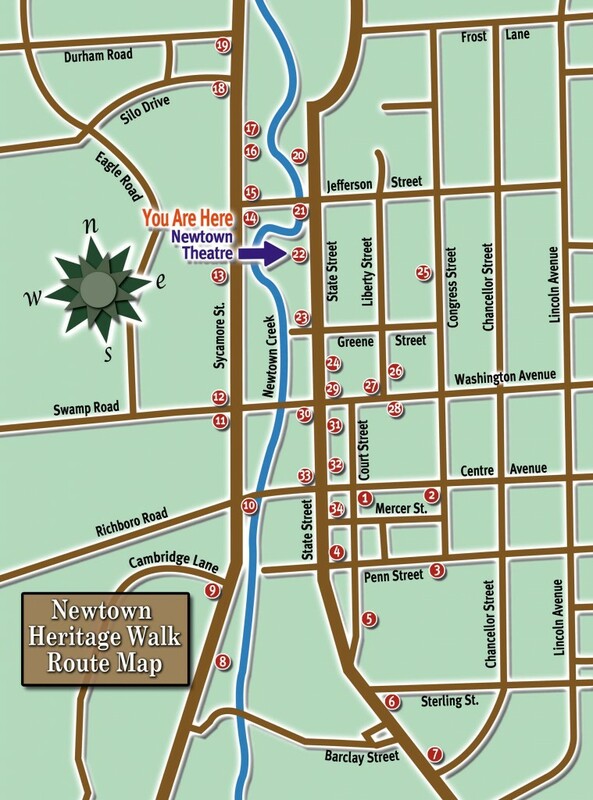 Visit all 34 locations on the Newtown Heritage Walk and try to answer the Newtown History Detective Questions. 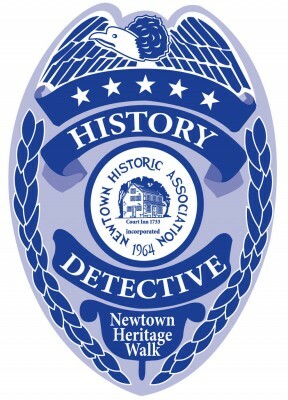 Turn in your completed Newtown History Detective form at the Half-Moon Inn and you will receive an official Newtown History Detective Badge. 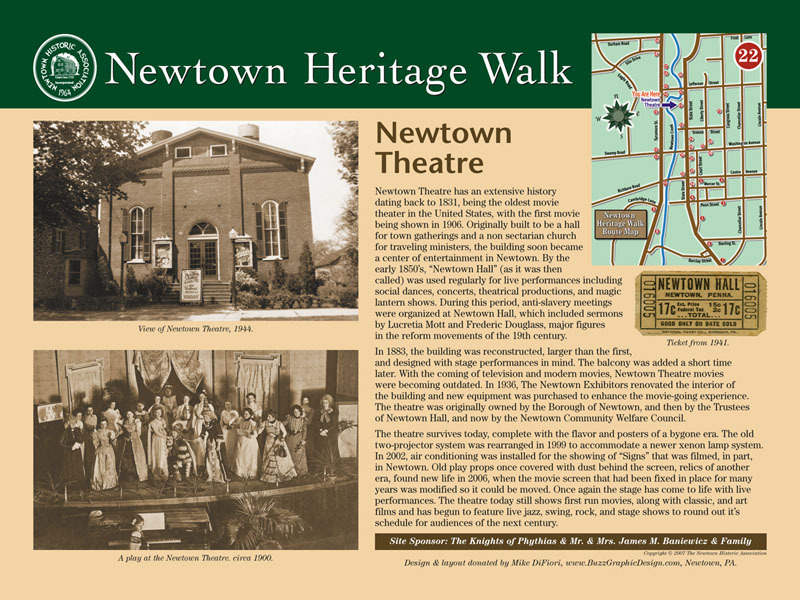 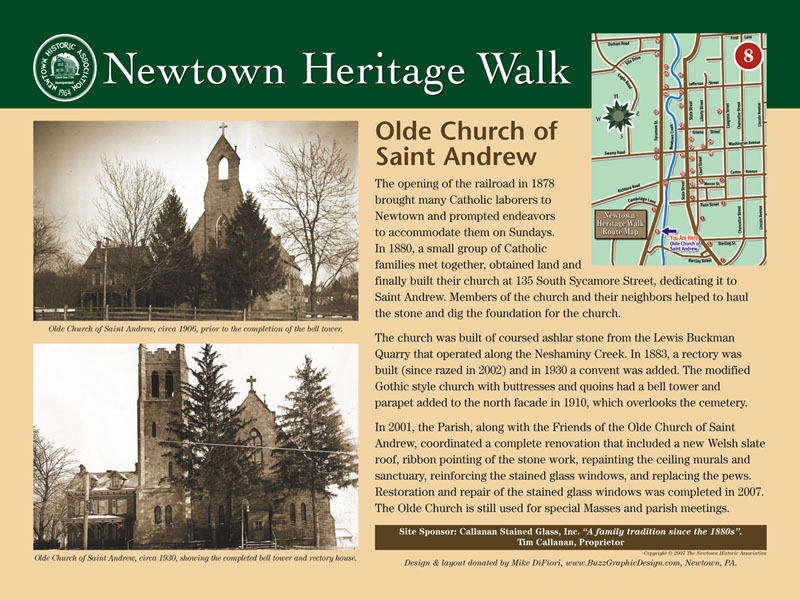 The Newtown Historic Association coordinated all aspects of the project, including: selecting the sites, developing the signs and brochures, obtaining the necessary HARB, Borough and Township approvals, confirming site sponsors, coordinating the installation with the property owners and the official launch of the Heritage Walk program. 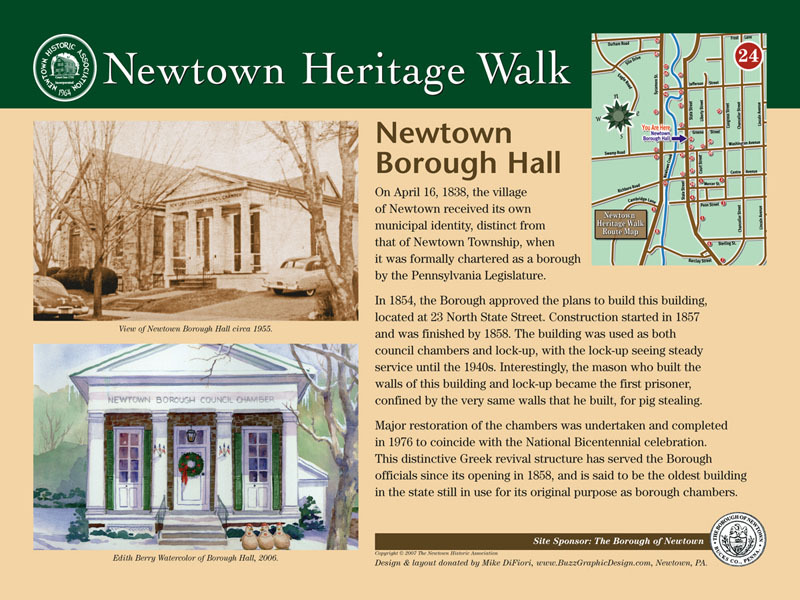 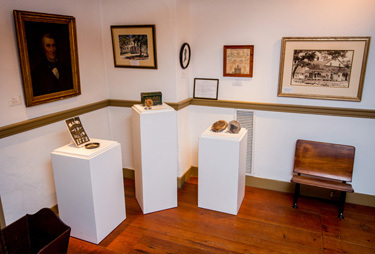 Historical Significance – Sites must be considered historic, preferably have been built in either the 1700s or early 1800s, and have contributed to the historical character and/or cultural development of the Newtown community (Borough & Township). 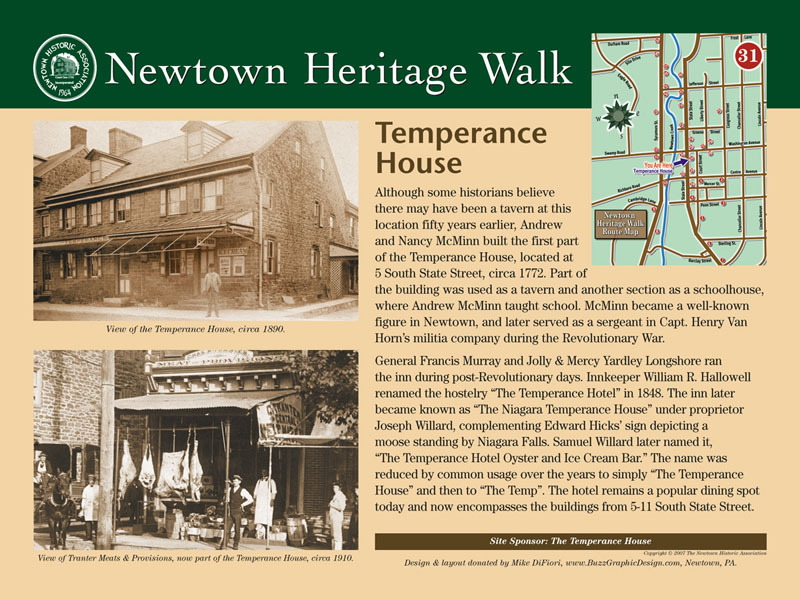 Location – Sites must be located on either State Street (Borough) or Sycamore Street (Township), or within a one- or two-block radius, to maintain the contiguous flow of an historic walking tour of the downtown Newtown community. 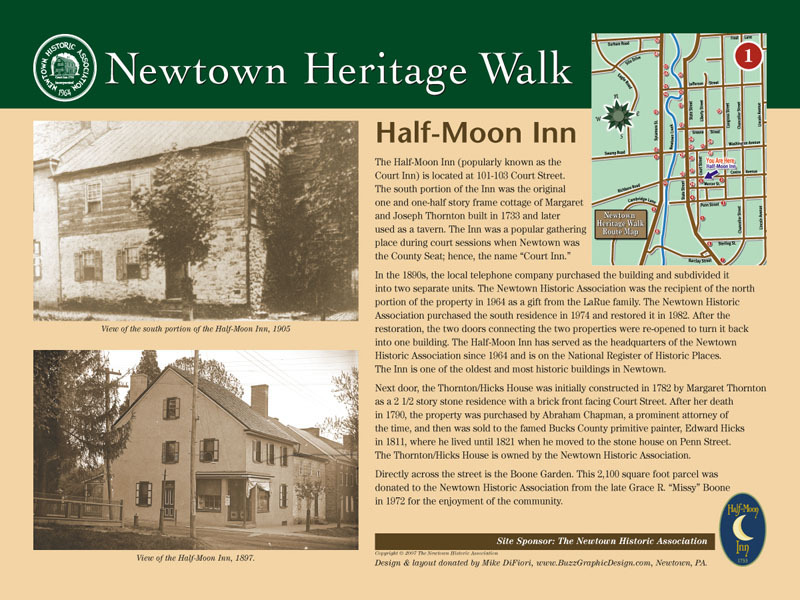 Architectural Merit – Sites must exemplify, embody or exhibit the unique architectural, construction and design features that have come to define the Newtown (Bucks County) community. 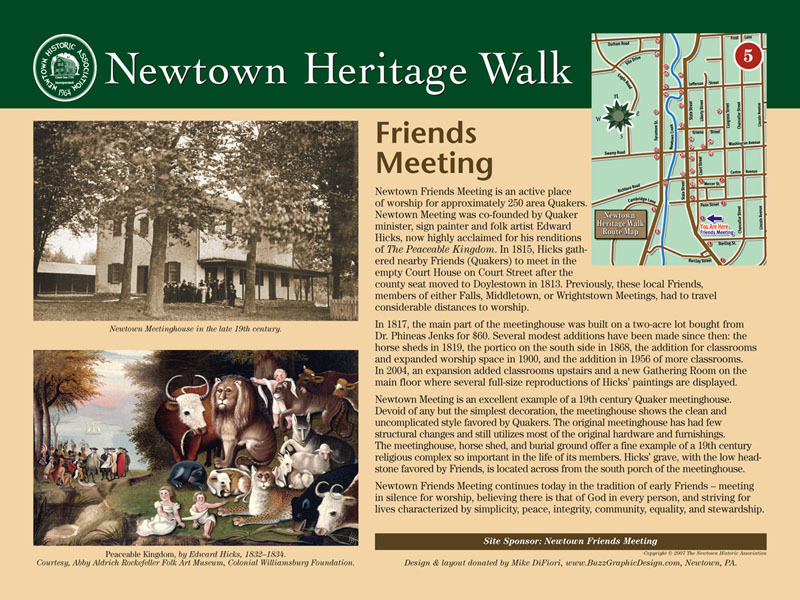 Sponsorship – Sites must be funded by a sponsor(s) to help cover the fixed costs of the site marker, brochure and marker installation. 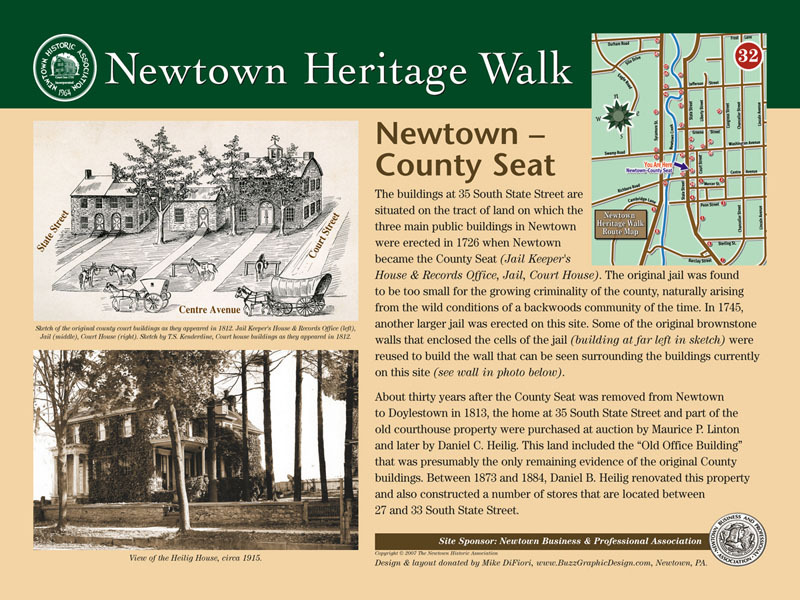 Newtown Township installed the signs along Sycamore Street. 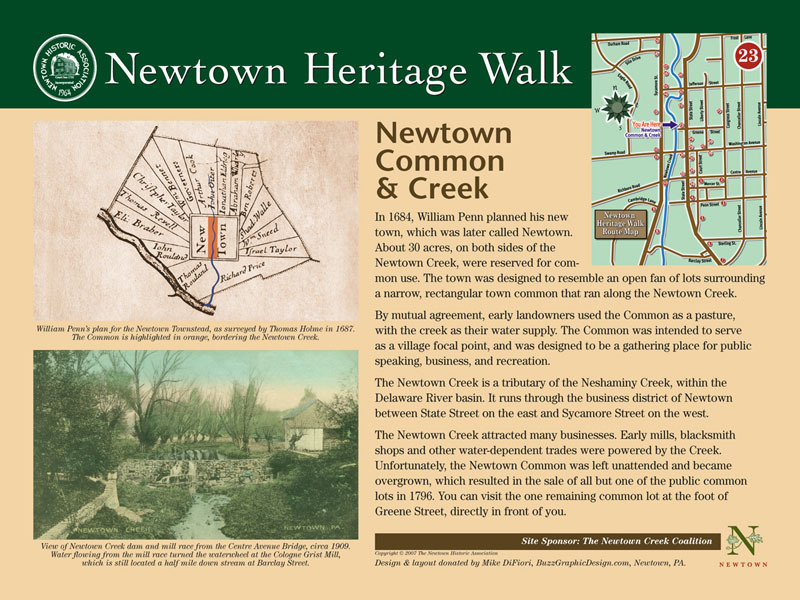 Total Number – Every effort has been made to be judicious and equitable during the site selection process, so as to place a practical and reasonable limit on the total number of signs and not to overly “clutter” the streets of Newtown. Sample diagram of a site marker. 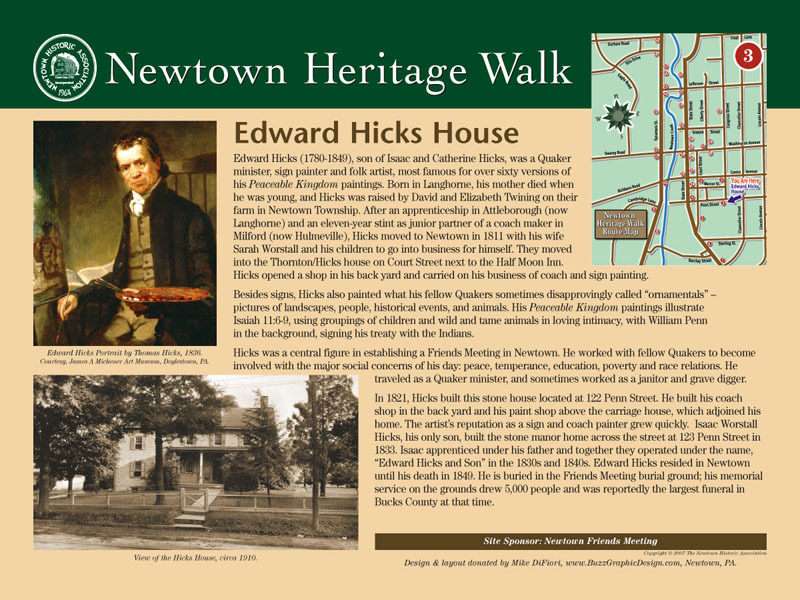 ADA Compliance – The law does not consider interpretive signage to be essential; therefore, ADA regulations do not apply. 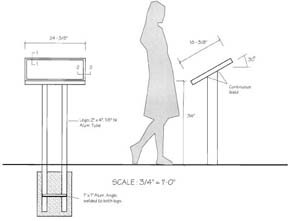 However, the National Park Service recognizes 30″ to 34″ above standing grade to be wheelchair friendly for low profile interpretive exhibits. 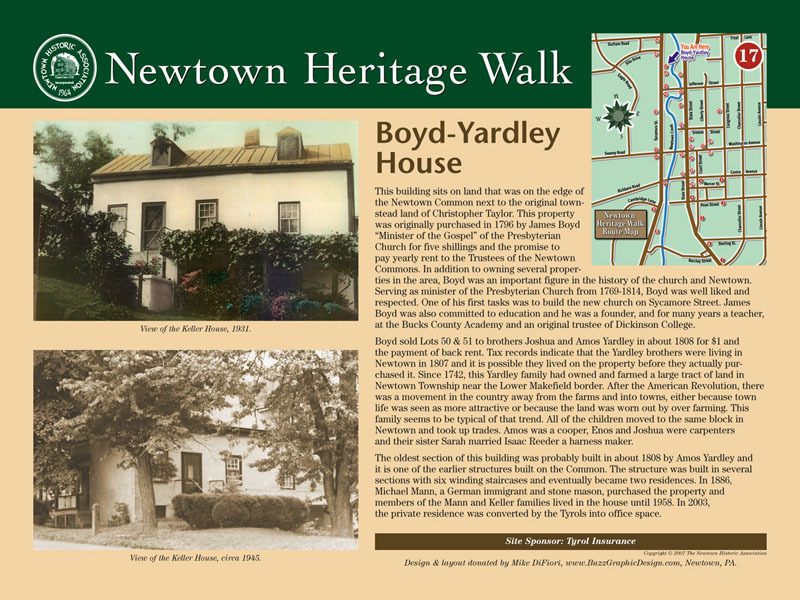 Therefore, the Heritage Walk wayside signs have been installed at a height of approximately 34″ above grade to be both compliant with NPS standards, suitable for handicapped and young walking tour attendants, and as elevated as possible for the unimpaired. 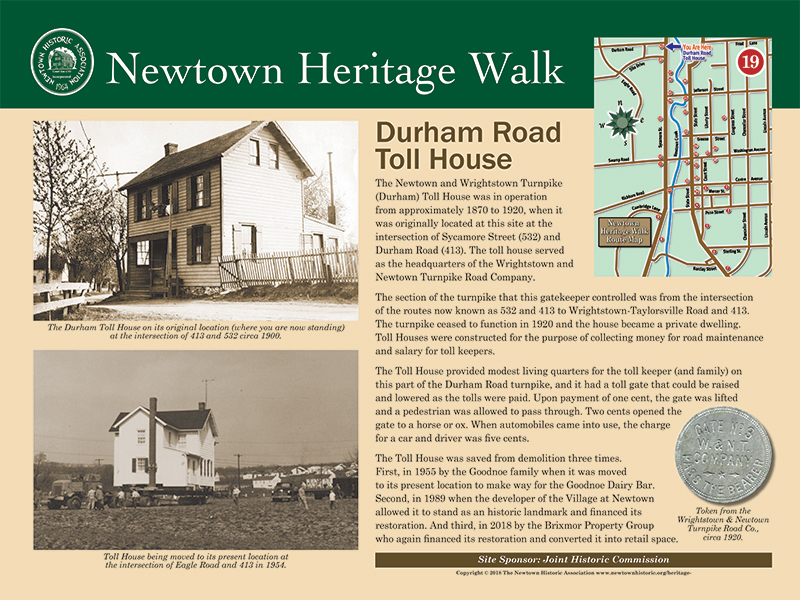 The wayside sign panels are mounted at a 30-degree angle for ease of viewing at all heights. 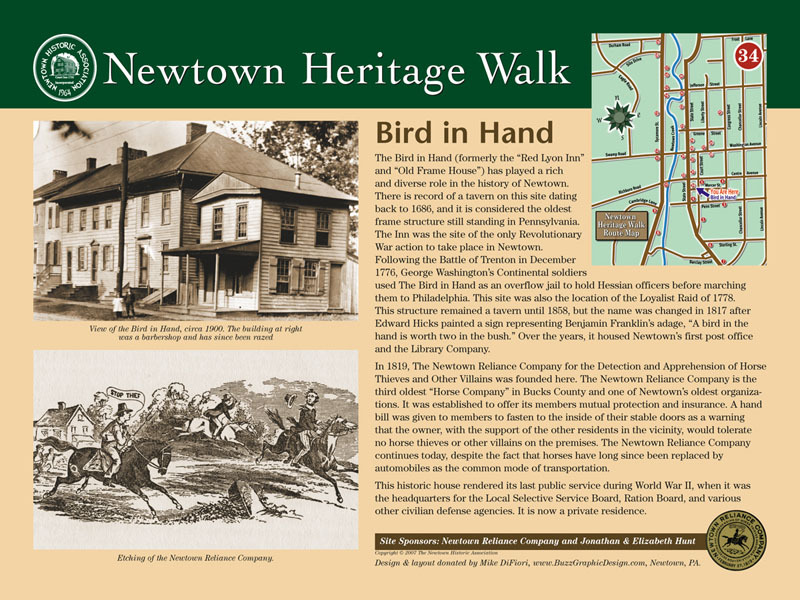 The design and layout of the individual wayside sign panels was donated by Mike DiFiori, DiFiori Design Group (fomerly Buzz Graphic Design). For more information on this project, please contact Brian Rounsavill.